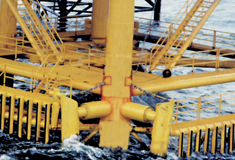 Oil States fendering systems are used throughout the world to protect offshore platform structures against damage from water-borne traffic. The fender protects the platform by absorbing impact energies. Fendering systems are elastomeric by design. Therefore, the greatest energy absorption occurs as a result of deflection of the fender and/or internal stress/strain relationships of the elastomer material. Elastomeric units typically operate in axial shear and/or radial compression. Oil States fendering products are extremely resistant to compressive loads. The fendering unit is capable of storing large amounts of energy in comparison to wood or steel fendering systems. Oil States offers numerous fendering components including Load Cells, “D” Bumpers and Rub Strips. Extremely resistant to compressive loads. Capable of storing more energy than wood or steel fendering systems. Energy absorption can be varied by elastomer compound selection. In-house elastomer compounding lab assures quality materials and proper compound formula for client applications. Excellent impact strength, tensile strength and abrasion resistance plus flexibility at low temperatures.